In India, it's illegal to sell a device locked to a specific carrier. And Apple has been accused of violating this rule. While Apple says they heard nothing of the complaint, the Competition Commission of India is initiating a probe into the matter. The unlocked iPhone 4 is sold through two carriers, Airtel and Aircel, as well as other retail stores. 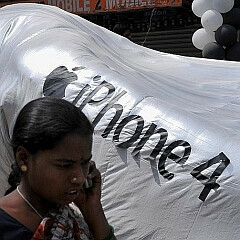 Airtel and Aircel offer discounted data plans to offset the initial cost of the iPhone 4, and make use of their new 3G networks. We imagine this might be what has been construed as an anticompetitive practice. A journalist visited one of these carrier's retail channels, and found no evidence of carrier-coercion. When the journalist asked about carrier exclusivity, the employee said that "If your operator can provide you a micro SIM, you can use it on the iPhone 4." Additionally, there are complaints regarding the inability to purchase iPhone apps outside of the App Store. Good luck with that one, India. Seriously? How naive are you? It's actually that way in India since the dawn of mobile phones and carriers in the country. Although it's not illegal but it's permitted if the consumer on his/her will signs a contract with the carrier for a phone. It gets noncompetitive (anti-competitive) if the carrier offers a reverse subsidy which means a consumer is able to recover almost 99% cost of the handset over a period of time via schemes and offers of the operator. Now that might sound as good news but the ones who actually benefit the most from this are the operator and the mobile phone company. And that is what the Competition Commission has objected to. the first part makes sense... (if apple was actually doing that) the second one... well... good luck with that. I will prove myself right when the ip5 gets released on Verizon this September. Watch how it would dent the figures of android users on Verizon, and you guys will know that I am right. Just think about how the ip4, almost after a year of release, was still able to significantly impact the user percentage within Verizon. How much more when the ip5 comes out? I bought Android due to the iPhones limited capabilities. It was available in plentiful quantity. "Apple is accused of anticompetitive practices" and nobody is surprised. Just make your profile name "IDontLikeApple" and call it a day. You're post makes no sense to me and I don't find any relevance in it ??? Sniggly, you shouldn't confuse US Anti-Competitive practices (such as the Sherman Act, The Clayton Act, etc) with those abroad, respectively. If you do that, then you are simply putting your foot in your mouth yet again. Yet again, eh? I'm not talking about laws. I'm talking about Apple doing just about anything it can not just to beat the competition, but to be the only game in town and not even let anyone else in to compete. Sniggly, Apple is giving customers a great value proposition. The tablet market has been around for 10 years prior to the iPad; the Microsoft tablet PC started in 2000. Apple didn't invent the smartphone either, it just made a better product. The same goes for MP3 players as well. You come across like the other manufacturers who got caught with their pants down. It only took Apple 15 months or so to overtake RIM. I'm talking about how Apple tried to get jailbreaking declared a felony, how they have sued every single one of their major competitors for everything ranging from the name of a service to the shape of the phone. I'm talking about Apple's work to ensure that their products are the single most obvious object in stores and online. How they sue everyone for copying them but have no problem shamelessly ripping off of their competitors. And how about that neat little policy of leaning on their business partners to ensure that their coffers are the only place with significant profits? They make products that work. Great. But Apple has a hissy fit if their products and services aren't presented first, second, third and fourth ahead of their competitors. And God forbid if someone else starts making more money than they do. Sniggly, you are being unctuous. First, you talk about anticompetitive practices, then you switch gears on how Apple is the bad guy for protecting its own intellectual property rights. How is Apple's addressing jailbreaking being anticompetitive? That is a HUGE stretch. Apple developed the AppStore and has a trademark on said name and Amazon is trying to benefit from Apple's sweat equity. Let's example Apple's history of ripping off from its competitor: Apple's iPad ripped off the PC tablets, Apple's iPods ripped off existing MP3 players, Apple's iPhone ripped off existing cumbersome, ugly, hard to use smartphones, etc.. Here's the fact you continue to miss ... Apple is a SOFTWARE company that also makes hardware, but what separates Apple's products and the key to their success is the software. Google copied Apple's pinch to zoom technology. So please get this simple point: APPLE is all about the SOFTWARE -- the fact the physical product is aesthetically beautiful, and polished is secondary. Apple is leaning on its suppliers because the suppliers haven't passed on enough of their savings to Apple. Apple has given their suppliers a lot of business and in some cases, capital to build new plants. vishu9, where in hell did you get your facts when you wrote: "Apple was juts forced to pay $40 billion as royalties to Nokia in the copyright infringement case." If you really, really believe that then you are really, really stupid. That is one of the dumbest comments one can make. I think you misunderstood this article sniggly. If you really think about it, Apple is limiting themselves to only a couple of carriers, when they can be on all carriers and even have bigger sales figures. So how can you say that they want to be the only game in town and not let anyone else in to compete? apple makes good products but sniggly is right apple wants everything to begin and end with them. They haven't even partnered with FLASH for crying out loud because it would hurt their pride. The reason practically everyone hates apple is because it's restrictiveness and exclusivity. If you have an apple iphone you have to have an apple computer, an apple ipad, ect... They make good products but it's not for everyone.